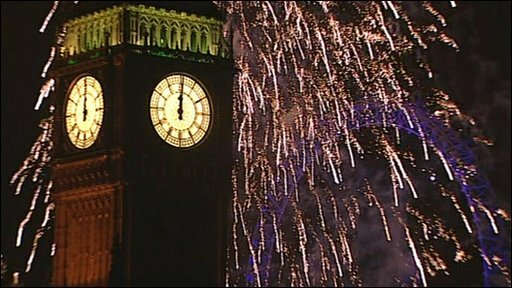 Hundreds of thousands of people across the UK have gathered to see in 2010 amid spectacular firework displays. In London, more than 200,000 people gathered along the banks of the River Thames to hear Big Ben strike midnight. Fireworks erupted over the London Eye for seven-and-a-half minutes and there was also a display in Cardiff. Some 80,000 people braved temperatures of -6C (21F) to enjoy Edinburgh's fireworks and music, while 10,000 turned out at Glasgow's Hogmanay party. There were no civic events in Belfast for New Year's Eve and celebrations were cancelled in Inverness because of severe weather. The London Eye's £313,000 firework display was cut by two minutes this year, helping organisers save a total of £70,000. Mayor Boris Johnson had said London's display would show the world that "the most exciting city on Earth" is looking forward to the future with "optimism and energy". 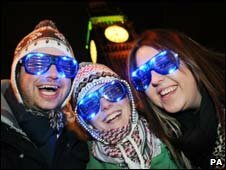 It was a clear night in central London, where partygoers enjoyed a comparatively balmy 3C. More than 3,000 police officers were on duty in the capital as part of a huge operation to deal with the crowds. St John Ambulance treated more than 300 casualties and took more than 50 people to hospital in the capital. More than 400,000 people lined the streets of central London for the New Year's Day Parade. London's 24th annual parade covers a two-mile route. It started at Piccadilly at midday and ended in Parliament Street at about 1500 GMT. In Manchester 8,000 people gathered to see in the new year. Ambulance crews in the West Midlands said they had their busiest new year yet, receiving 1,269 emergency calls in the first three hours of Friday. A spokesman said the busiest time was from midnight to 0300 GMT, with a call on average every nine seconds. South East Coast Ambulance Service said it received 1,080 calls during the last two hours of 2009 and the first four hours of 2010. The service, which handles 999 calls across Surrey, Sussex and Kent, said most of the call-outs were for falls, breathing difficulties or injuries in fights and assaults. In Edinburgh, partygoers watched a firework show above the castle, followed by a laser and light display in Princes Street. Earlier, those attending the Concert in the Gardens were entertained by 80s band Madness and pop act Noisettes. Three stages along Princes Street provided entertainment by bands including Indie rockers We Were Promised Jetpacks and rock band The Enemy. People had travelled to the city from around the world. Jenna Tolley, 20, from Wollongong in New South Wales, Australia, said: "The atmosphere is great and all the people really friendly." Across Scotland, ambulance staff had their busiest night of the year as the country welcomed in the new decade. The Scottish Ambulance Service said it dealt with 2,247 calls in the first seven hours of the new year - up 5% on last year. A large number of the call-outs were for alcohol-related incidents. Pete Irvine, creative director of the Edinburgh event, said it had been an "extraordinary night" in the city, "with brilliant music, a magical fireworks display against a full moon sky and the dramatic castle slopes dotted with snow, and a friendly and euphoric atmosphere that you won't find anywhere else in the world." The street party is the highlight of a five-day Hogmanay Festival in Edinburgh, featuring a torchlight procession and dance and music events, which ends on Saturday. In Glasgow revellers packed into George Square for the city's sell-out Hogmanay party, headlined by Deacon Blue. In Aberdeen a fireworks display was held over His Majesty's Theatre at midnight, while the streets of Stonehaven, in Aberdeenshire, were lit up by the 150-year-old fireball festival. The event in Inverness was cancelled as road and pavement conditions were considered too treacherous. Ch Insp Andrew MacLean, of the Northern Constabulary, said: "For reasons of public safety, we made a recommendation to the organisers and they have decided to cancel the Hogmanay party." Meanwhile, the closure of Inverness airport meant several hundred passengers had to find overnight accommodation in the city. However, 16 opted to stay in the terminal to see in the new year with champagne and pizza.